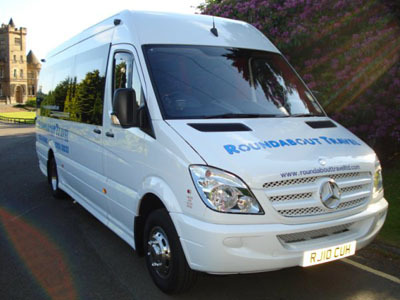 Roundabout Travel is a small family run minibus hire business based in Stirling, Central Scotland which was established in 2007. All of our mini buses are modern and well maintained to a high standard. Our minibuses are regularly serviced by experienced mechanics to ensure that your journey will be both smooth and comfortable. Customer satisfaction is our top priority; we promise you will be more than happy with Roundabout and your minibus service. Roundabout Executive Travel are really happy to have an extremely satisfied and regular base of clients in both public and commercial sectors that continue to use our service for all of their travel needs. Contact us to find out how the reliable and professional service that we provide throughout the Central Scotland area can benefit you.